Hello, kids! Would you like to meet giant pandas with your parents? Have an unforgettable close encounter with “Meet the Giant Panda” and help take care of giant pandas with your parents! 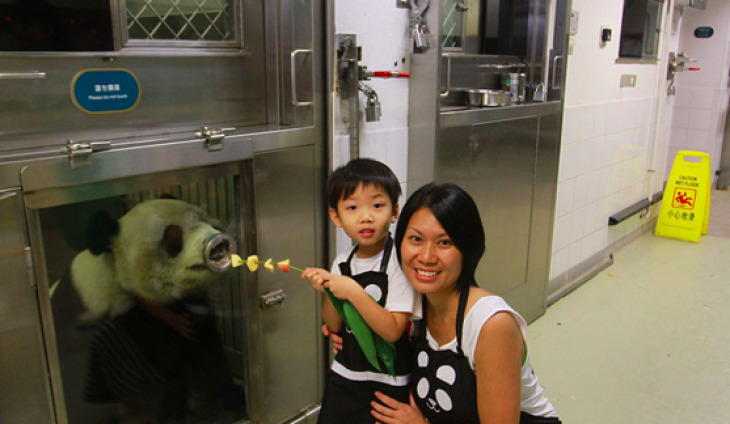 Our animal keepers will take you where the giant pandas live, and you will learn how to prepare food for them! There will also be fun interactive games to play with your parents, which teach you about wild pandas and their conservation! Participants are advised to wear sports shoes to join the programme. Participants will not have any physical interaction with the animals. Cantonese, supplemented by English and Putonghua. Apply In-person at Ocean Park Ticketing Office, Main Entrance: Minimum 1 day’s advance booking before 5pm.